Jane and Roger Hargens were moved to found Operation Middle Ground after reading the story of Curtis Gearhart, a young Iowan who joined the U.S. Army upon graduating from Lincoln High School for Des Moines. Curtis, who served two tours of duty in Iraq as a combat engineer, was honorably discharged in 2007. His family knew Curtis wasn’t the same person he had been prior to his service. Although he sought treatment, he couldn’t find peace. 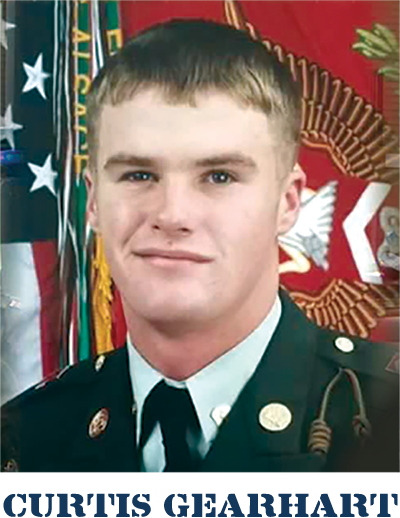 Shortly before his death, Curtis suffered from debilitating headaches, but was placed on a Veterans Administration waiting list for medical care. He was 32 when he took his own life on Nov. 7, 2016. He is survived by two daughters, Lola and Vivian Gearhart; his wife, Sarah Gearhart; parents, Joni (Craig) Frette of Des Moines and Curtis P. Gearhart of Ankeny; three brothers, Justin and Broc Frette and Clayton Gearhart; two sisters, Leah Frette and Shawna Allen, grandparents, Vivian Kinkade and Phyllis Frette, and many friends. Curtis was laid to rest on Nov. 10, 2016 at the Iowa Veterans Cemetery in Van Meter, Iowa. Months before his death, Curtis wrote on his Facebook page, “High highs, and low lows. I wish my life had a middle ground.